The lack of evidence of gas chambers at the Treblinka death camp in Poland has been used again and again by Holocaust deniers as “proof” that the Nazis did not exterminate 6 million Jews. There can be no doubt at all that the Nazis did murder hundreds of thousands of Jews by machine gunning them into pits all along the eastern front and in the Aktion Reinhardt camps, of which this camp, Treblinka, is one. On a short clip posted on Youtube he even attempts to claim that the only people killed at the execution wall were Christians. Irvine is trying to obscure the scale of the Holocaust. He is trying to reduce the role of Treblinka to one of a transit camp and by subterfuge deny the existence of extermination camps. The fact is that around 900,000 Jews were murdered at Treblinka alone – and it wasn’t by machine gun: the method of execution was by gas. The Nazis developed their plans for the “Final Solution” – the mass murder of the Jews – at the Wannsee Conference on 20 January 1942. The extermination program was codenamed Aktion Reinhard. On Heinrich Himmler’s orders, SS Commander Odilo Globocnik carried out Aktion Reinhard in occupied Poland. Three secret extermination camps were set up specifically for the operation: Treblinka, Bełżec and Sobibór. All three were equipped with gas chambers disguised as showers for the “processing” of entire transports of people. The Nazis began deporting Jews, mostly from the ghettos of Warsaw and Radom, to Treblinka in July 1942. By October 1943 over 900,000 Jews had perished in Treblinka, 500,000 in Bełżec and 200,000 in Sobibór. The numbers are numbing, incomprehensible and anonymous. Some details of how Treblinka was run and the scale of the killing operation have been obtained from the testimonies of the few survivors and the confessions of Nazi guards. One chilling observation made by two survivors of Treblinka was that the floor of the gas chamber was made of red tiles with the Star of David embossed on them. The Nazis installed these tiles in order to give the impression to those entering the chamber that they were in fact entering a Jewish bathhouse. The Holocaust Education and Archive Research Team has put the testimony of others who survived Treblinka online. But the Holocaust deniers put down these testimonies, citing the lack of any evidence of gas chambers as proof that Treblinka was not a mass extermination camp. They have relied on the Nazis’ own attempts to cover their tracks. Raul Hilberg, in his path-breaking opus The Destruction of the European Jews, describes how the Nazis tried to hide the traces of their great crime. The Bug camps (Treblinka, Sobibor and Belzec) were evacuated in the fall of 1943. The Wirth Kommando, which constructed these camps, were ordered to destroy them without leaving a trace. At Treblinka a farm was built over the site and a Ukrainian was invited to run it. Since the end of the Second World War the Treblinka site has hardly been studied – everybody had assumed that because the history books said the camp was “totally” destroyed, it was. But six years ago, Caroline Colls and a team of archeologists from Staffordshire University began excavations at Treblinka. These were the first ever excavations of a Nazi concentration camp and are still ongoing. Their findings have destroyed the lies peddled by Irvine and other Holocaust deniers. 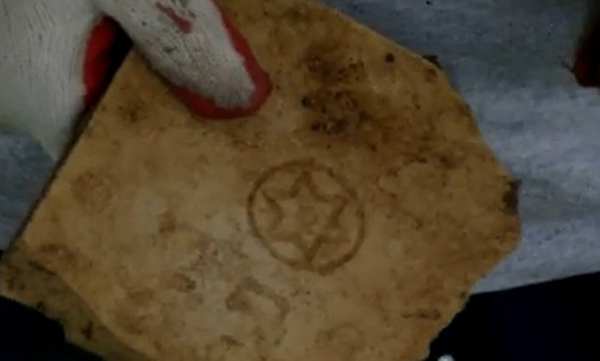 And at the centre of this story was the discovery of a small red tile with the Star of David embossed on it. There were two camps at Treblinka. Colls and her team began their studies and excavations of the two sites in 2008. You can read initial findings from the excavations of Treblinka I – a forced-labor camp where prisoners were made to manufacture gravel for the Nazi war effort – and, little more than a mile away, the Treblinka II death camp. 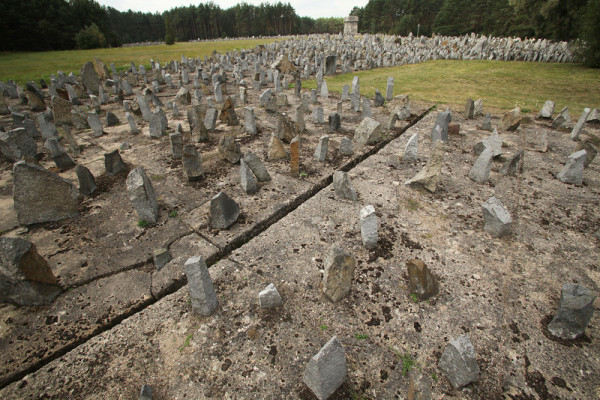 Colls and her team conducted four excavations at Treblinka II. The first two found very little. But the second two trenches revealed a brick wall and foundations. These were the remnants of the gas chambers: they were the only brick buildings in the camp. There were two sets of gas chambers built at Treblinka, the first with a capacity of about 600 people, the second able to hold about 5,000. But another vital discovery was made in trenches three and four: they revealed a number of tiles that matched eyewitness descriptions of the floor of the killing chambers. Each tile was stamped with a Star of David. Even in this place one can survive, and therefore one must want to survive, to tell the story, to bear witness; and that to survive we must force ourselves to save at least the skeleton, the scaffolding, the form of civilisation. We are slaves, deprived of every right, exposed to every insult, condemned to certain death, but we still possess one power, and we must defend it with all our strength for it is the last — the power to refuse our consent. But managing to survive the camp was not the only form of resistance. There was an armed uprising by forced labourers in Treblinka on 2 August 1943. On that day one of the organisers of the uprising broke into the camp’s arsenal. He managed to pass out 20 grenades, 20 rifles, several pistols and ammunition. Just before the signal was given for the uprising, an SS guard caught one of the leaders with money in his pocket and started to beat him. Out of the shadows a Jewish prisoner appeared with a pistol and shot the Nazi dead. The arsenal exploded and many of the camp buildings were set on fire… The chief of the guards SS Quartermaster Sergeant Kittner, was shot dead, and in the ensuing fighting fifteen other German and Ukrainian guards were killed. Of the 700 Jewish camp workers in the camp, more than 150 escaped. The rest were killed in the camp. One of the escapees would later give testimony describing the tiles in Treblinka II. The survivors who bore witness to the horrors of Treblinka, and who in their darkest hours remembered the floor tiles with their distinctive six-pointed stars, have enabled historians and archeologists to piece together a small fragment of the history of the Holocaust.